It is truth that one can find a vast range of things to do in Thailand. Ones’ time can be shared between visits to buddhist temples, elephant rides, relaxing massages, walks in the tropical forests and discovering and tasting the local specialities. Most important, however, is to relax and enjoy the smiling faces and warm hospitality of the locals. The ideal place for one to experience all of the above is the Rayavadee Resort, situated in Krabi , Thailand, 800 km from the noisy bustle of Bangkok and 2-hour car drive from the popular resort of Phuket. Add to all this the friendly and courteous staff you already have more than enough reasons to visit. green all around vertical rocks and mythical gardens enchant the visitor. The locals will greet you handmade bracelets made from flowers , fresh coconut juice and will guide you around their heavenly grounds. will have its own garden, with jaccuzzi, hammocks and lounge deck chairs, where you can enjoy relaxing massages from the specialised personnel of Rayavadee. The resort boasts four different restaurants, where you will surely find whatever your heart or stomach desire! . Raya restaurant is ideal to begin your day with enjoying the morning buffet. Krua Pranang, promises to introduce you to the original Thai cuisine and also entertains with professional dancers in traditional costume who perform to the Royal Family even until today. Mediterranean flavors await at the Raitalay Terrace at the central swimming-pool of the hotel. 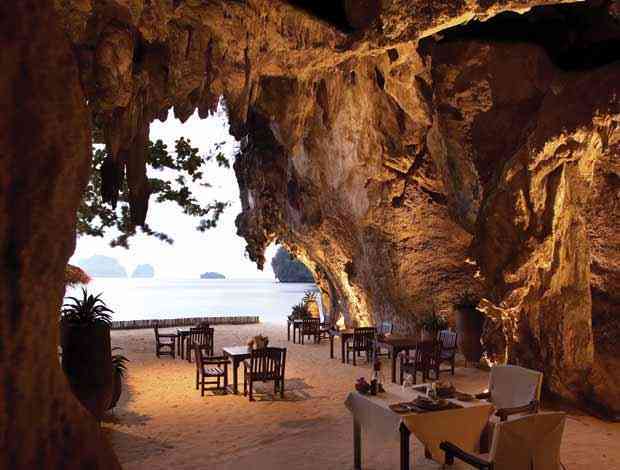 Grotto, nested in the impressive rock of Phranang Beach, is the ideal location for a special romantic dinner. Sitting on one of its tables scattered around the beach one can enjoy the enchanting sunset. A visit to the spa is a must! Try the Rayavadee signature massage you will not regret it ! and enjoy the aromatic local tea offered at the beginning and the end of each treatment. daily activities and excursions, elephant rides, mountain climbing, trekking etc. and the popular Bamboo Island with its all white sandy beaches. Upon arrival the Rayavadee staff will prepare a picnic on the sand consisting of gourmet , local delicacies that is sure to make your stay truly unforgettable! With a speedboat transfer worthy of any James Bond movie, a honeymoon at Rayavadee on Thailand’s Phranang peninsular instantly sets the scene for a glamorous and indulgent romantic hideaway. So much so, that you can even take a day trip to nearby James Bond Island which is where The Man with the Golden Gun was filmed. Being a member of the exclusive Leading Hotels Of The World means that five-star luxury is a given – all of the uniquely designed two-story pavilions and private villas are set within 26 acres of gorgeous tropical gardens and are surrounded by dramatic limestone cliffs. It’s the perfect escape from the real world.